The Hanjet Waterproof Tarp made from a tight polyethylene weave which provides super durability and flexible solution to all of your covering needs. It can be used as protection for boats, cars or motor vehicles. Camping tarpaulin provides shelter for these elements, wind, rain or sunlight for campers, such as an emergency roof patch material for homeowners; as a temporary pickup truck bed cover, and for a ground or drop sheet. All edges are heat-sealed and reinforced with polyethylene rope. Heavy-duty rust-resistant grommets provide extended durability and the ability to securely tie it down. 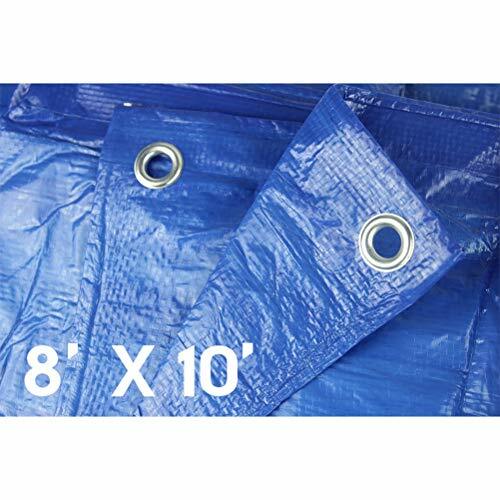 This tarp is great for covering a floor area or keeping items protected from the elements. Other uses included using is as a makeshift shelter, covering a boat, keeping firewood dry, and providing shade. The amount of uses are nearly endless for this product! Note: Mil is the thickness of the material, one mil=0.0254mm; All full sizes, no "cut sizes". Warning: Flammable. This product will ignite and burn if brought into contact with an open flame. If you have any questions about this product by Hanjet, contact us by completing and submitting the form below. If you are looking for a specif part number, please include it with your message.